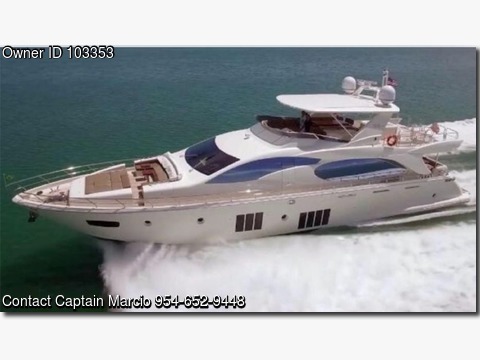 Please call Captain Marcio at 954-652-9448. Boat Location: Coral Gables, Florida. Radar: Raymarine GS series touchscreen. GPS: Raymarine GS series touchscreen. Compass: Zenith and White Star magnetic. AIS: integral to Raymarine system. Water heater: 2 100-liter electric. AC: Cruisair chilled water. 2 Caterpillar C32 engines; 1800 HP; Max RPM 2300; 350 HRS each. 2 Kohler 32-kw generators; RPM 1800; 4 cylinders. Stainless steel frame sliding doors with curtains. Marble sole and laminate sole heads. Marble vanities with porcelain sinks. Showers with water jets, grate sole, overhead lights. Teak over hydraulic fiberglass swim platform. Approx 250lb Fjord-type anchor with 300’ chain.